This week, I'm bringing you more from Woman's Home Companion. 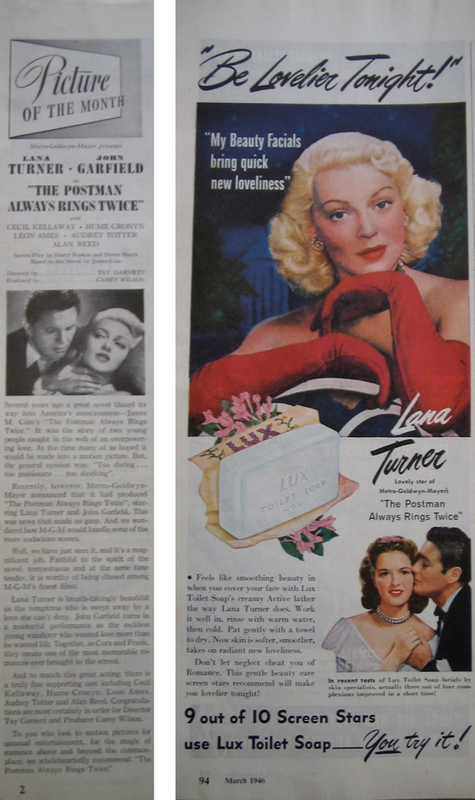 The "Picture of the Month" (see below) is The Postman Always Rings Twice and there's a Lux ad featuring Lana Turner, as well. Based on James M. Cain's book, the film stars Ms. Turner and John Garfield as lovers who decide to get a pesky husband out of the way. Despite some sanitation for the censors, The Postman Always Rings Twice is pretty faithful to its source material. I enjoyed the book more (maybe because I read it first) but that doesn't mean the film isn't worth watching. It's really well done and thoroughly enjoyable, especially if you like 40s fashion and/or film noir. This was a great movie to watch en famille at my house, because Paul's really only interested in watching 40s films if they're "noir" or have lots of airplanes in them. He likes Casablanca, too, but I think that's just his soft spot showing. 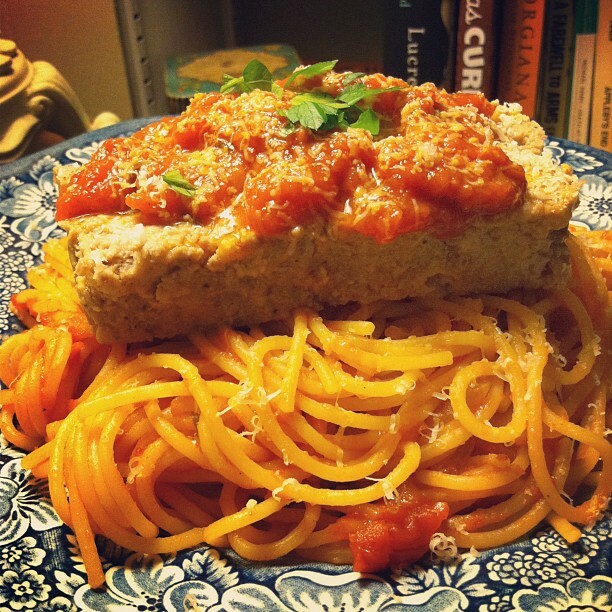 Moving on to the dinner part--this has to be one of the best meatloaf recipes ever. There's no ketchup topping, the veal makes it ultra luscious, the lemon keeps the flavors bright and it reheats like a dream. Serve Monterey Meat Loaf fresh from the oven with mashed potatoes and a green vegetable. For the leftovers, you can simply reheat it (wrap in tin foil and heat in the oven; it won't dry out) or make a meatloaf sandwich or use it as a meatball substitute with spaghetti and tomato sauce. Whichever way you decide, it will be yummy. Those home economists at Woman's Home Companion in 1946 knew what they were doing. Preheat oven to 350˚ Fahrenheit. Grease a loaf tin (8 1/2" x 4 1/2" x 2 1/2") and set aside. In a large mixing bowl, combine all ingredients, except water, and mix. If your mixture is too stiff, add water to thin it out (this is to compensate for lemons of varying sizes). Add mixture to loaf pan, even it out with a spatula and bake 1 hour and 15 minutes. Adapted from "Monterey Meat Loaf" in March 1946 issue of Woman's Home Companion, p. 114. In a stock pot or dutch oven heat the olive oil over medium-high heat until a haze forms over it then add the onion and cook until onion is softened (about 8 minutes) but not browned; turn down the heat if necessary. Add the remaining ingredients, bring to a boil then reduce the heat and simmer, partially covered, for 40 minutes, stirring occasionally. Adapted from "Salsa di pomodori" in Recipes: The Cooking of Italy. *I'm looking forward to trying Hannah's homemade version.